Play Dough Orchard Mats for Literacy, Math, and Crafts! Fall is a great time to live in an area that has definite seasons. The leaves on the trees turn majestic shades of orange, browns, reds, and gold. 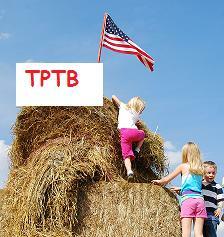 The picture above was taken at a family farm open to the public for the season. Check out your own local farms and see if they offer activities for families. We visit Rader Family Farms many times during the Fall. It’s a great way to celebrate the gifts of the season! Print off the numbered play dough mats. Laminate for durability. Have the children roll small red, yellow, or green balls to represent the apples on the trees. Place the required number of “apples” on the mat. Extension for older students: Have students write the number or number word on the lines. 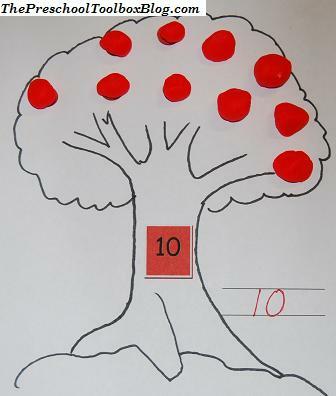 Extension for older students #2: Have the students roll a predetermined amount of balls to place on the tree and subtract or “take away” the number on the tree. Extension for younger children: Have the children use a number stamp to stamp the corresponding number on the lines by the tree. You might also write the number on a separate sheet of paper and see if the children can try to copy the number to the lines. Have the students count out loud as they place the “apples” on the tree. Have older children use orange play dough (to represent pumpkins) and place near the bottom of the tree. 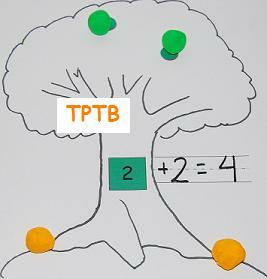 Add the “pumpkins” and the “apples” together to teach basic addition skills. Write a letter on one of the blank trees. Have the children roll “worms” out of the play dough and form into different letters. Younger children can “stamp” the play dough. In the picture above, we use magnetic Alphabet letters to stamp our dough (can use with any number, too). 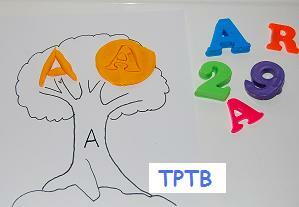 Print the blank trees and ask the children to decorate any way they wish. While playing outside, have the children gather dried leaves in a zip lock bag. Ask the children to “scrunch” the leaves into “confetti” pieces. Use liquid glue with the leaf confetti for a great looking fall tree! ENJOY the FALL SEASON with your children!! 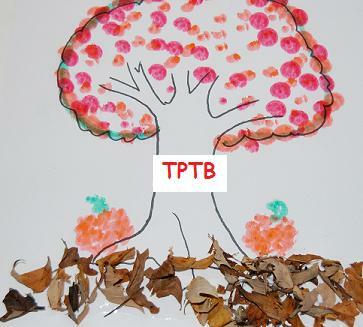 Check out more Fall Theme ideas or see Preschool and Kindergarten Themes for Active Learning and Play! « Krispy Rice Pumpkins and Spice Drop Cookies with Pumpkin Dip!